3.5 StarsI have a somewhat mixed history with Austen. I really love both the film adaptation of Sense & Sensibility with Emma Thompson & Kate Winslet, and the film adaptation of Pride & Prejudice with Keira Knightley & Matthew Macfayden. However, when it came to actually reading the latter for my AS-Level, I actually came pretty close to loathing it-with Lizzie Bennett being pretty much the main redeeming feature. 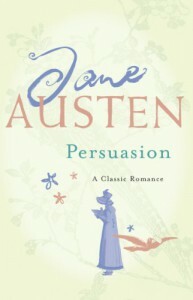 However, I really wanted to give Austen another go, and hearing people say that Persuasion is one of her best I thought I'd give it a go.Persuasion was published after Austen's death, it was the last of her works to be published and the tone is definitely one of reflection on things that have been missed in life; the novel is about Anne Elliot and Captain Wentworth who were once in love and ready to get married, but where separated by Anne's family, only to come across each other some seven years later. It lacks the heavily ironic narrative tone of P&P, it almost reads like a kind of retelling of Cinderella; Anne Elliot being all sweetness and light between her sisters Elizabeth and Mary, both of whom are snobbish and self-centered. And this was the main problem I had with Persuasion. I loved the main plot idea; exploring whether two people can still have the same feelings for each other having gone around seven years apart. However, to me Anne felt kind of one-dimensional. Whilst Lizzie Bennett was anything but conventional, Anne was very much sweetness and self-sacrificing, and really not that interesting. I did like seeing her struggle with her emotions towards Frederick; but Frederick himself didn't really feel well-developed either. He just seemed like a stereotypical charming man. I also somewhat lacked a connection to their relationship, as their entire previous engagement was mentioned in a paragraph and then never really developed again.Despite this, I found the plot pretty engaging, especially with the character of Mr Elliot, a kind of more attractive Mr Collins who will inherit Anne and her sister's property, who apparently seems interested in Anne now. Mary also had to be a rather hilariously self-involved character, who sees herself as far more important in the social ladder than she actually is. It's certainly a gentle and ultimately sweet read; it really filled my desire to read a 'nice' book.